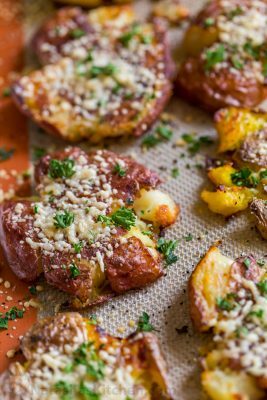 These cheesy smashed potatoes are crisp on the outside with a creamy center and irresistible cheesy crust. Bring a pot of water to boil and add 2 tsp salt (Note: 8 cups water for 5Qt pot). Once water has boiled, carefully add potatoes then reduce heat to a low boil and cook until potatoes are tender and easily pierced with a fork then drain (total boiling time is 25-30 minutes depending on potato size). Meanwhile preheat the oven to 450˚F. Transfer drained potatoes to a lined rimmed baking sheet, spacing them evenly. Use a potato masher or the flat bottom of a drinking glass to smash the potatoes to about 1/2" thickness. Press gently so you don’t break the potatoes apart. Drizzle the tops with olive oil then sprinkle generously with garlic salt and black pepper to taste. Bake at 450˚F for 15 min. Flip potatoes over with a spatula, drizzle the second side with oil and season with more garlic salt and pepper. Bake another 12-15 min or until potatoes are crisp with golden brown edges. Sprinkle generously with parmesan cheese then return to the oven another 2-3 minutes or just until cheese is melted. Garnish with parsley if desired and serve warm.